This year we explored whether graduates had been exposed to working in a library prior to enrolling in an LIS master’s program. Over half indicated they were not already working in a library prior to starting their master’s program. Twenty-two percent of graduates held an advanced degree when they began their LIS programs. A few had already earned two or more advanced degrees. While many did not specify the field of their prior degree, 19% specified a Master of Arts, and 3% a Master of Science. About 6% of prior advanced degrees were PhDs, with an additional of respondents 2% reporting incomplete doctoral studies. Among the students who provided more detail, 22.9% were in humanities fields, including history (4.3%), English (4.3%), divinity/religious studies (2.4%), and fine arts (2.4%). Some 12.9% of respondents already possessed a JD degree. For those with advanced degrees in social sciences, about 10% were in education, 4.8% were MBAs, and about 5% were in some other social science field, (e.g., psychology, social work, communication, or political science). Only about 2% were in science. We were also interested in those earning a dual degree or certificate while pursuing their LIS degree. Only 8% of respondents indicated that they had been dual enrolled. Among the dual-enrolled graduates, 14% also pursued a master’s degree in history, while 11% earned a certification related to teaching or school media/librarianship. Other recurring areas were master’s degrees in English (7%), children’s literature (7%), or art history (5%), or certificates in archival studies (7%) or cultural heritage preservation (5%). A few used concurrent opportunities to complete certificates in emergent areas such as digital curation or homeland security. Some did not provide information regarding the focus of their additional degree/certificate. An interesting finding is that for the majority of respondents, their LIS master’s will not necessarily be the final graduate degree they pursue: 14% intend to earn another graduate degree and 47% were open to the possibility. Nearly nine out of ten graduates said online courses played a role in their LIS program. More than half completed programs fully online. About a third said their programs used a combination of on-site and online course delivery. Only 12% completed LIS programs that used on-site instruction only. Almost two-thirds earned degrees called MLIS; about another one-fifth were called MLS. The remaining respondents earned an MIS (6%), or some other variation (10%). Graduates shared experiences or activities associated with their LIS programs that proved to be helpful in or important to landing their first professional position. More than half (54%) indicated that practical work experience through a practicum, internship, or fieldwork was instrumental in this key career step. About half of the graduates completed one or two internships during their LIS program, and 7%, three or more. Some 44% did not complete an internship. Technological prowess such as database searching or web skills was also cited as an important factor in employability (52%). Many graduates affirmed the importance of networking with professionals (41%), while about a third stated that their job area/subject specialization was a helpful factor. About a quarter noted that specializing in a particular kind of library helped them be hired. Only 12% felt that holding an additional certification was important for being hired. Respondents were asked about their LIS program’s requirements beyond coursework. The majority of graduates created an ePortfolio as their culminating experience (56%). Thirty-two percent completed some form of work experience—an internship, practicum, field work, or student teaching—as a graduation requirement. For the traditional capstone options, more graduates wrote a thesis (22%) than took comprehensive exams (13%). Formal projects were done by 19% of respondents. Other culminating experiences mentioned by small numbers of respondents included taking additional courses, performing service learning, oral presentations, creating research proposals or posters, independent study, or creating a professional development plan. More than half of graduates already employed by libraries stayed with the same one after graduation. Most experienced a positive change in their placement, including raises, promotions, or gaining professional or tenure-track status. For graduates who are now working for a different employer or hold a different position from while they were in a master’s program, investing a significant amount of time in their job search was required. These graduates reported starting their search about 5.1 months prior to graduation, slightly later than last year, when searches began an average of 5.7 months before graduation. While 44% secured their position prior to graduation, the majority had to wait an average of 4.2 months after graduation. The results this year suggest that placements are occurring more quickly than in 2015, when only about a third of graduates found their position before graduation and the average placement occurred nearly 5 months after graduation. The 2016 graduates identified the three most helpful resources they used during their search. The most frequently cited was a job posting site or listserv maintained by an LIS school. 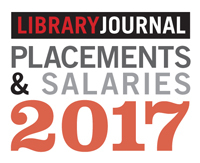 The American Library Association online jobsite and emails were also mentioned by many respondents, as were resources from other professional organizations including SLA, MLA, ACRL, SAA, and AALL. Other productive resources were job posting sites for government agencies like state libraries or public library systems or USAjobs.gov. General sites for jobseekers, like LinkedIn, Indeed, and Glassdoor, as well as LIS-specific resources like INALJ or the Archives Gig blog, were also noted, but by fewer graduates. Some respondents used a different strategy by directly searching the websites of organizations they were interested in working for, and some noted networking and personal relationships as helpful for their search. It was enlightening to learn about the search process from the graduates’ own words. Comments from over 400 graduates reflected the wide-range of post-degree experiences, from positive and enthusiastic to frustrated and discouraged. This distillation of their comments, grouped by key themes, provides a vivid account of the 2016 graduate experience. Preparedness: Employed graduates stressed the importance of being well-prepared and following good protocols. They emphasized keeping orderly records, and using job listing resources systematically. Other highlights were tailoring each cover letter to the specific skills of a position, priming references, attending other jobseekers’ presentations, updating their resume, doing mock interviews with mentors and peers, staying in touch with HR departments, and doing background research on the organization in order to link their own skills to its strategic goals. Work Experience: Both employed graduates and those still seeking employment emphasized that the success of a job search improved with prior work experience in library and information settings. Many advised that volunteering or working in non-professional positions provide a foundation that is important during the hiring process. Aligning with earlier results, graduates noted that internships, practicums, and field experiences were very valuable springboards for landing a professional position. Respondents complained about the lack of paid internships in LIS, compared to many other professional graduate programs, and many felt that this kind of paid opportunity should be a required component of the degree program. Many of unemployed graduates complained about a Catch-22: there is a lack of entry-level jobs that can be held by graduates who are inexperienced professionals, and some professional jobs do not count internships or paraprofessional jobs towards years of experience, while the lowest level professional jobs still require a year or two of experience. Networking: Graduates underscored the importance of networking with established information professionals, peers, LIS educators, and members of professional societies. Suggestions included asking employed alumni and former classmates to share relevant job announcements, seek out mentors at professional conferences, and set up informational interviews with successful librarians in managerial roles. Boldness and patience: Respondents advised job seekers to maintain a bold and optimistic attitude, to apply “fearlessly” for all kinds of positions, and to take chances by applying for prestigious post-graduate internships or jobs they may not be fully qualified for. They noted the importance of resilience, of not being discouraged by hearing “no,” and exhorted job seekers to “be persistent, not picky.” Patience was also cited as necessary, to progress through an entry-level, part-time, or temporary job first and build towards the professional job or organization desired. Mobility and flexibility: Many successful job seekers mentioned that being willing to relocate was crucial to being hired quickly. Several also advised hunting away from cities that contain LIS schools, where oversaturation of the market is more likely. Keeping a flexible attitude also increases opportunities for job-seekers, as some graduates exhorted others to “sell” their degree and skillsets to non-library employers by mapping them to the descriptions for non-traditional positions, or be willing to take a library position in a service area different from the one for which they trained. These graduates noted that they were surprised to find out how much they enjoyed living in a new area or working in a different setting than they had expected. Some noted the importance of finding a job in an organization that is a good “fit” for one’s interests and personality, and balances personal and professional priorities. Valuable skills: Respondents mentioned these general skills that they feel are important for getting hired: effective public speaking, technology skills, additional languages, making effective presentations, leadership development, and creating a good ePortfolio. Opportunities: Some graduates shared tips and observations that could help facilitate the job search: cultivate a few good professional mentors who can advise you about the interview and negotiating a position. Keep in mind that you are always interviewing for a job, because you never know who is hiring. Appreciate the power of tools like Linked In or the ALA job board. Take tours of libraries and archives and other places you want to work. Earn a second masters to have a subject specialty. Challenges: Both hired and still-job-seeking graduates mentioned challenges they found in securing a professional library position: a dearth of true entry-level positions, bias toward internal candidates, ageism in hiring, a need for more exposure to vendors and non-traditional employers and more guidance on resumes, negotiating salaries, and being overqualified for a paraprofessional position which could serve as an entry point for a library. Some noted that job placement services for online and satellite-campus students are not on par with those available to on-campus students. Complaints: Some graduates, primarily those who have not yet found full-time professional positions, expressed frustrations: a perception that there are not enough jobs for all LIS graduates, issues with using the LIS degree to change fields, a scarcity of jobs in archives, perceived deficiencies in what they learned from their LIS program about librarianship or coding, insufficient help from their programs about what employers are looking for, frustration with low pay, a K-12 school district that no longer requires an LIS masters for school librarians, debt burden from school loans, the lack of maintenance of job databases by LIS schools, civil service exams and other barriers imposed by some public library districts. A few simply said they were at a loss to explain why their job searches had yet not been fruitful.